Today is the last day to use the 20% off for me, 20% off for you email discount at Anthropologie. If you didn’t receive this email code on February 1st, don’t despair! Check the comments, where helpful community members have been sharing codes they don’t plan to use. Earlier this week Anthropologie released hundreds of new arrivals. I don’t really have much to say about them. I’m bored and tired of waiting for this corner Anthro’s supposedly turning. I’m sick of all the 70s-inspired shapeless stuff and I’ve given up hope that Anthropologie will ever again find the waist or 50’s-inspired shapes or designs that flatter universally rather than just a very select segment of the population — the very thin, small-busted segment. It’s very telling to me that the most appealing (and I use that phrase lightly) new stuff to me is from the bathing suit cover-ups. No new dresses on my wishlist. Hardly much of anything, really. Anthropologie’s parent company Urban Outfitters released its quarterly results (the call is upcoming) and they did quite well last quarter, with a 5% gain in sales. They are close to recovering to their pre-dive results. So I have to just shrug. Since what they’re doing seems to be working, it’s clear I’m not their target customer anymore. I do think they have several pretty jackets right now. I love the Pilcro Floral-Printed Moto Jacket ($148) and continue to love my Faravel Moto Jacket ($148) a couple years into owning it — I just pulled it out for today’s lovely weather in NYC actually! 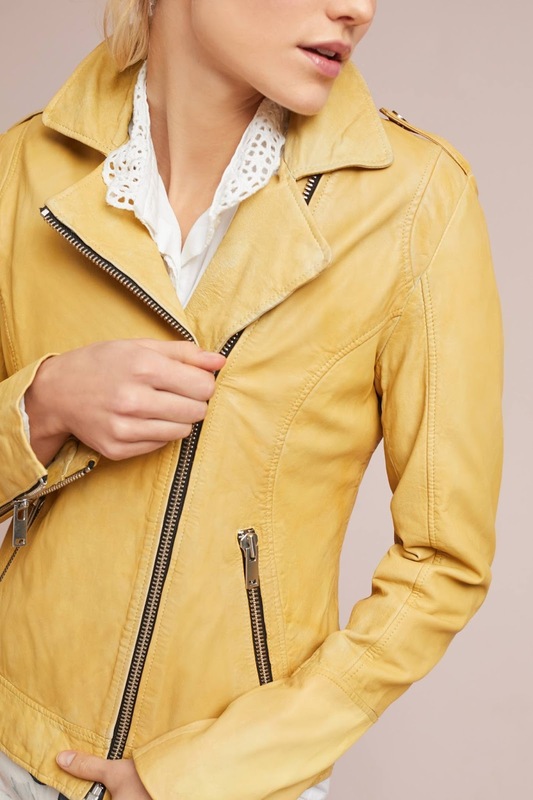 BlankNYC continues to draw me into its embroidered moto trend with the Wildflower Moto Jacket ($148). Yet, I can’t help but heave a sigh at most of Anthropologie’s selection. When I look around at other stores that are capturing my attention right now — Madewell, J. Crew, LOFT, American Eagle; three of those four have started using models with curvier body types which delights me to no end! Madewell and J. Crew did it without any fanfare which delights me even more. Even Target is delightful right now! Old Navy too, and both of these stores are also incorporating more diverse models of many sizes. Meanwhile Anthropologie uses the same lithe models it always has and puts them in ever more disastrous stylings. I’ve got $1,200 in Anthropologie gift cards and no must-haves to use them on. Maybe I’ll buy a bunch of pretty jewelry? Or shorts in prep for warmer weather? Below, some of the items sitting in my cart right now as possibilities for this promotion. What have you ordered during this special offer, and what might you order today? 😛 … I used it mainly to buy shoes and beauty/skincare actually. Yes so true! Such a first world problem. 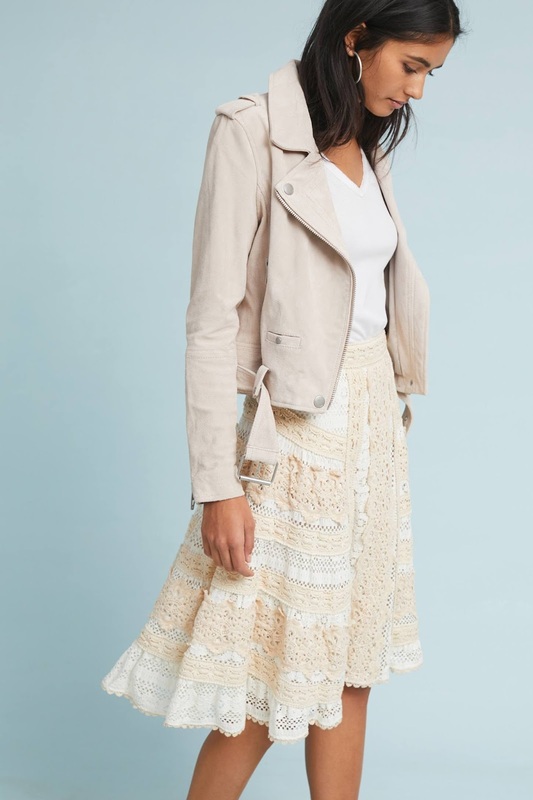 Maybe this is misplaced loyalty but I am TRYING so hard to buy only clothing with the gift cards so Anthropologie can see where I feel they're doing well, but if I don't find stuff soon I may end up following your lead PHG. "Ever more disastrous styling" — Word, Roxy. Word. I finally spent some gift card stash in store last week on some candles (sigh) and the James Coviello lace top, which is pretty but also as comfy as a t-shirt. The Burnham in yellow. The colour is amazing. I am very tall but high-waisted. I found it to straddle the line of too short, but as long as I wear it with something with a higher rise, it's all good. I think if it were longer it would then be too narrow to accommodate most normal human female hips (mine included). Yeah – I don't think we're their target market anymore. I accepted that a while ago.Right now my return pile is larger than my wishlist. I have to stop being a loyalty shopper and just buy things that are amazing.. I've been branching out a little bit everywhere to other stores. I do have a really good chain of upscale consignment stores in my area, and I've been relying heavily on that to fill my closet. And I agree – first world problems. I had fun while it lasted. I so hear you Anthropolitan. I too am trying out many other stores now. It struck me that there was no "it" must-have coat or sweater coat this past winter. That in itself is pretty unusual. Yes, no beautiful coats and no pretty and unique sweaters any more during winter time. I am still wearing old Anthro sweaters from a few years ago. Disappointed but good for the wallet. Not that I needed another coat or sweater coat! No Elevenses this year which probably explains the coat drought. Of all the things I wish they'd re-release, the Elevenses cardigans circa 2009-2010 (the Elodie Lily cardi for example!) are HIGH on the list. Pretty translucent buttons. Gorgeous embroidery. LONG. Etc etc. I actually own that Elodie cardi – bought it on Ebay a few years ago! i remember the Elodie cardi and did the same. I was soo in love with Anthro and haven't bought anything in a while (actually I moved to FL in June and think it was last March?). What I did buy during holidays I returned, except for non-clothing. And I didn't even get the 20% coupon email. Ugh that's SO annoying Bronzi that you still don't get emails, I know this has been an issue for you for a long time!! I don't get the promotional emails either no matter what has been tried. I get all other shipping and order confirmation emails just fine. They have a serious bug there they can't seem to fix. It happened to my sister too yet my other sister gets the promotional emails just fine. I definitely like many new arrivals and have extensive wish list. The only thing that stops me from shopping is my recent weight gain. I'm still hoping to shed those much hated pounds. I've already lost 1/3 of what I want and very hopeful to lose the rest in 2 month or less. After that I'm shopping like there is no tomorrow. My issue is that most clothes I like are online only. I must say that my workplace is casual and my social life is even more casual. I could have lived my life in denim but I love dresses too much. That's awesome about your wishlist Tanda! If you live a more casual lifestyle I can see why more of Anthro's stuff would appeal to you. I can totally relate on the weight issue — I am on my way down after an injury caused a weight gain for me. It takes time but I have no doubt that you'll be back where you want to be by your goal time! I too wish more items were available in-store instead of being online-only. I did get an email from Anthropologie in the last couple of days that the Westport (CT) Anthropologie & Co is now going to carry Michael Stars in-store, which I thought was interesting. I like two new tulle skirts by Eva Franco. Both are impractical, which is why I probably like them – there's nothing good on the wear to work side. Boo on the polyester though – it seems that is the material of choice these days. The black and white skirt is my first choice I know the yellow one would add volume on my hips so it's likely a no go. I emailed the Anthro personal stylist for tips with both skirts and did get some good tips for the black and white skirt that I'll purchase on sale, somewhere down the road. Honestly, I don't know what is keeping Anthropologie afloat. I visited the store last weekend and it wasn't busy – sad really. It will be interesting to see if their home store does well. The Chicago Avenue store is being converted to a home store. Their stuff is pricey and while I like some of it, I'd go to Bob Williams + Gold, or some other higher priced store vs Anthro. But I digress. I got an email for an upcoming fashion show – $10 with that fee being donated, thanks but no thanks. P.S. ALL of women's clothing is in a state of crisis IMO. I've not purchased new (non workout) clothing this year. J Crew is sad and uninspired and dull. Banana, Gap, Ann Taylor, Anthro are polyester overload. Nordstrom looks cheap to me now. I've been holding a Bloomingdale's gift card for months! Nothing. I wonder how many of these stores will even be left in 5 years. I do think Anthropologie's home stuff is very popular with interior designers. I see it featured in home magazines often. Yes I agree about the state of women's clothing in general. But I think some stores are starting to pick it up again, while Anthropologie lags far behind. I have been buying home items (the Old Havana dishes recently came home with me to dress my table for Easter. I bought the white dinner plates and then side plates in each of the fun colors). I have a duvet cover in my cart that I may pull the trigger on today. But the clothes make me sad. It takes SO MUCH trying on, buying the "on-line" only items only to return them, browsing and browsing just to find one or two items to keep. It used to be that I would have an entire dressing room of beautiful items that I'd want to bring home with me. Now, I am lucky to find or two items PER SEASON that I purchase, and even then, only at discount. I never buy full-price at Anthro anymore. Yes, well said! Long gone are the days when I'd spend all of my disposable income at Anthro. If anyone still has a 20% off code I could use one. Email to hdierckman@etczone.com. Thanks! I hope you received a code Heather!! I agree : I have a 20% off coupon, but I probably won't use it. I just return 95% of what I order. From Canada. So I'm trying to be wiser with my purchases. I return because: 1) it doesn't fit right, 2) it's not special enough or 3 )it isn't the quality that I want. Like the Evelyn dress (but it's part rayon, so it will shrink), Embroidered Denim Pencil skirt, Embroidered shirtdress, and linen temptations. I agree….there are definitely several cute dresses on the March Preshop that I would love to try! Thanks so much for sharing the pre-shop link!!!! Oooh, pretty! Thanks for sharing the pre-shop link amles. Although I like the look of the Faithfull Linen Midi Dress yet I'd bet money that the bust will never fit me. And this is part of what continues to disappoint me about Anthro. Do you still have a 20%off code you won't be using? My email is mnm083@aol.come, if you have it please email it to me. I totally agree! I could never wear any of this to work. What happened to the cute, quirky clothing that was made for real women's bodies? I have no idea, but I greatly miss it too. I hope you received a code Janice! Free Shipping on all orders (no minimum)! I completely agree with you on the curvier models-so nice to see! I've noticed Athleta has several body types in their catalogs also. Love it. Yes! Did not think of Athleta but you're right, they're nailing it too. It's not a big deal, it's just so much more appealing to me when I see models of a similar body type in looks. I often end up researching 'plus size' looks just so I can see models with more curves. It's eye-rolling but hey, it works! Marla this promotion expired in February, there are no codes left.